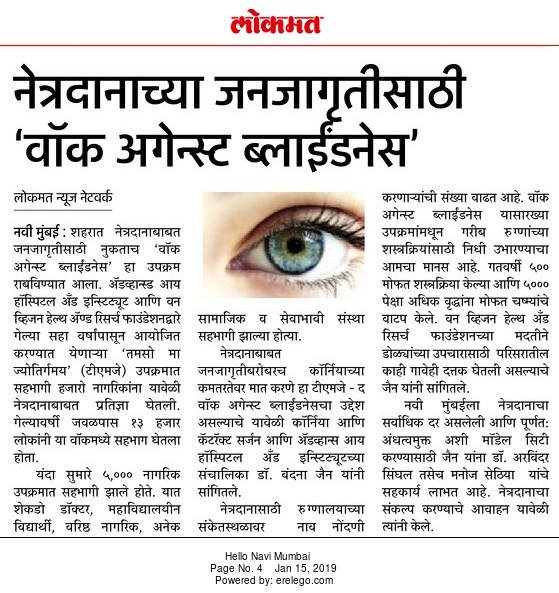 Tamaso Ma JyotirGamaya" (TMJ), World’s Largest Walk Against Blindness an annual event was organized by One Vision Health and Research Foundation and supported by Advanced Eye Hospital & Institute (AEHI) and reinforced wholeheartedly by numerous Schools, Colleges and Universities, Social Groups and NGOs of Navi Mumbai on 12th January 2019, 4:30 pm at CIDCO Exhibition Centre, Opp. Madhya Pradesh Bhavan, Vashi, Navi Mumbai.. According to the World Health Organization, approximately Sixty Eight lakh people are estimated to be suffering from blindness in developing countries like India. After Cataract and Glaucoma, Corneal Diseases and Diabetic Retinopathy are the most common eye diseases that cause loss of vision permanently. By 2020, this number is expected to reach one crore. Therefore, in an effort to bridge that gap, TMJ constantly endeavours to increase awareness amongst the masses about eye donation and other causes of blindness. In the previous years, we have seen tremendous response from more than 10000 people who joined the walk and supported the cause. This year estimated 15,000 people have joined the walk. This year, TMJ was loaded with double excitement and incredible performance. Several enthusiastic students from different colleges showed their talents through grooving dance performances. The programme was refreshing filled with enthusiastic sloganeering, and celebrity performances presented by RJ Archana Pania of Radio City. The social organizations and NGOs supported and joined the event included Fitterfly, Humanity First Foundation, Evolve Business School, Lions Club, Rotary Club, Kutch Yuvak Sangh, Leo Club, Lions Club, Rotary Club, Rotaract Club, Anti-Corruption Intelligence Committee, NGOs Awaaz Foundation, Tarun Mitra Mandal, Agarwal Samaj, Lohana Samaj, Kannada Samaj, Jain Samaj, Muslim Samaj, Mangalam Foundation, MGM Hospital Group, MITR Hospital and Yerala Medical Trust and many more. Bharati Vidyapeeth Nursing College, Bharti Vidyapeeth Architect College, Bharti Vidyapeeth Engineering College, Bharti Vidyapeeth Pharmacy College, CKT College, ITM College of Optometry, K L E College, NMIMS University, PILLAI College, Yerla Medical College of Management, Evolve Business School, F G Naik, R F Naik, Vijeta School, Ryan International School, Advanced College of Optometry are just a few of many eminent Schools, Colleges that have extended their support for this cause. Dr. Vandana Jain, Cornea & Cataract Surgeon and the trustee of One Vision Health and Research Foundation said, “Besides increasing awareness, events such as these help us to raise funds for poor patients. We did 800 free surgeries the previous year and distributed free spectacles to more than 8000 people. We also adopted some villages in a nearby area for free eye care. This year we plan to double the number of people and operate 1600 free cataract surgeries and distribute free spectacles to more than 16000 people. I urge all Navi Mumbaikars to work towards making Navi Mumbai a model city with highest rates of eye donation”. Let’s begin New Year by making a difference.